Samsung C4062FX Color Multifunction ProXpress - Perfecta Business Services, Inc.
Work smarter thanks to exceptional extensibility that continues to evolve and improve your printer’s performance. 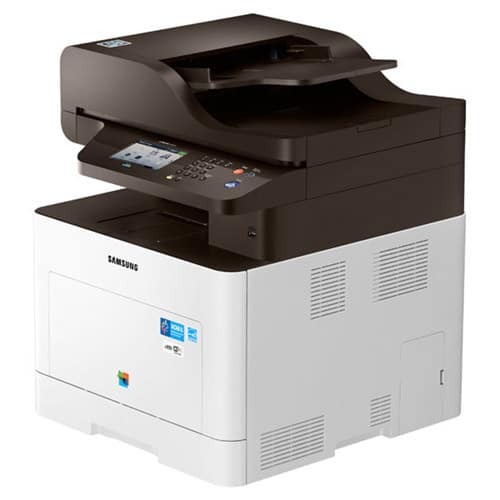 The ProXpress C4062FX Color Multifunction Laser Printer features the Samsung Smart UX Center powered by Android™ to deliver an open ecosystem for office productivity. eXtensible Open Architecture (XOA) gives you access to workflow, document and security solutions while a Quad-core 1.5 GHz CPU keeps the machine running at blazing fast speeds. The Samsung Smart UX Center is the industry’s first printing user interface powered by Android™. Complete with an open and steadily growing ecosystem of apps and widgets designed to enhance work productivity, the Smart UX Center offers exceptional extensibility that continues to evolve and improve printer performance, creating a smarter working environment. Improve work productivity by customizing the user interface to suit your company’s needs. Finding the right apps and widgets in the App Center can enhance workflow, cut maintenance, and reduce downtime by automating frequently performed tasks, or remotely diagnosing printer failures. For more information about our apps, please visit smartux.samsung.com. The Samsung ProXpress C4062FX comes equipped with an interactive 7-inch touchscreen panel to access the Samsung Smart UX Center. The touchscreen draws on the familiarity of tablets and touchscreen phones, making it easy to access the functions you need for work. The XOA-E (eXtensible Open Architecture) platform supports both Samsung in-house solutions and third-party ISV solutions to meet your business needs. Get access to a variety of solutions for workflow, process and document management, and security—all without a server. XOA-E unlocks advanced features typically associated with high end copier platforms and provides these at minimal or no cost. The ProXpress C4062FX supports high volume print loads with toner cartridges that yield 15,000 prints in mono and 10,000 prints in color1 per cartridge. Long-lasting consumables help to reduce downtime, maintenance and labor costs, which can lead to lower long term costs plus improved productivity. Dual Scan Document Feeder technology enables exceptional scanning speed and productivity. Scan at speeds of up to 40 ipm for single-sided documents and up to 60 ipm for double-sided.